In February 2018, Sasakawa USA completed Tabletop Exercise: Pacific Trident, a three day exercise testing the policies, strategies, and capabilities of U.S. alliances with South Korea and Japan as well as trilateral cooperation in the face of North Korean provocations. This timely exercise included top-level government and military officials and renowned academics from the U.S., Japan, and South Korea to simulate the decision-making that would take place in each country in the time of minor and major crises. The results of this exercise were published in a report for the public and for policymakers on March 22, 2018. 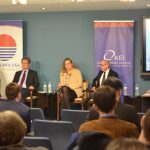 Read Testing Trilateral, U.S.-Japan, and U.S.-ROK Responses to North Korean Provocations: Tabletop Exercise Pacific Trident for a detailed account of the scenario and game play, as well as key recommendations and takeaways from the exercise. Sasakawa USA hosted a media event announcing the release of its report “Testing Trilateral, U.S.-Japan, and U.S.-ROK Responses to North Korean Provocations: Tabletop Exercise Pacific Trident.” This invite-only luncheon included a panel discussion on Exercise Pacific Trident, a three-day tabletop exercise designed to test the policy, diplomatic, and military responses of the United States, Japan, and South Korea to North Korean provocations that involve all three countries. 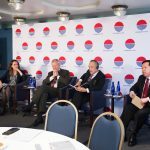 “U.S., ROK, and Japanese views considered in panel discussion on Sasakawa USA tabletop exercise” provides a recap and photos of the event, and a full video of the event in English or in Japanese is can be watched on the event page.